In my experience waterproof boots work exceptionally well...at keeping the water IN the boot and AROUND my foot. The big hole in the top is exceptionally good at letting water in. Nothing worse than that feeling as cold water seeps down your socks and you realize your rock-hop just became a ford. My daughter has had great success with low cut hiking shoes. Last time out I tried my son's low cut (he does not use them anymore and I sort of adopted them) and was surprised how comfortable they were. This was in Nov on Phelps with snow and ice. I am thinking with gaitors they should do the trick. Otherwise my boots are Keens. Super comfortable Voyageurs with mesh sides. Certainly not waterproof. But I have had good luck with underarmour sport socks as liners and wool hiking socks. Seem to work on same principle as a wetsuit. A "Dry suit" keeps water out. A "wet suit" lets a bit of water in, traps it and your body heats it up as I understand it. Not sure of the science but in the 3 seasons my feet get wet but not cold. Certainly not when the boots are brand new, but when the leather begins to breakdown on my Gore-Tex boots and starts to let water in after a couple years of heavy use, I will treat them with Sno-Seal and get another season or two of dry feet out of them. The "leather" on your goretex boots is of a poor quality. A quality leather boot uppers are stitched together using no glue. The waterproof membrane in your goretex boots breaks down with repeated flexing, thus leading to wet feet. Plastic based boots are far more cost effective than all leather. The leather on my Crestas is real and of fine quality. I got 10 years out of my first pair and going on 6 on my second. The Vibram tread gets low before the leather wears out. Plastic boots??? Yeah, my feet would love that. Don't you mean they are cheaper? My boots do indeed take a year round beating, as most times I'm well off a heavily traveled trail such as the NPT. As a matter of fact, I should purchase a new pair of "boots" before winter really sets in. Do you happen to have any good suggestions? I used to buy Herman Survivors and hiked all over Eastern European mountains with them. They were super comfortable AFTER they were broken in and fairly good at keeping out the water. I DON'T KNOW IF THEY ARE STILL AROUND OR STILL HAVE THE QUALITY THEY USED TO HAVE. They were all leather in the "olden days" and mostly all leather 25 years ago but who knows today? The mountains in Croatia and Herzegovina were especially hard on leather because of the molten rock's sharp edges. I bought a pair of new Herman Survivors off eBay and on the second day I wore them the sole fell completely off one and was falling off the other one. They were cheap but not cheap enough to make that short of a wear time economical. They were made in China as I recall. I will not buy that brand again. Survivors got offshored a while back, garbage ever since. +1 on the Vibram wearing out on the Crestas, suggestions on replacing it? Danner, though expensive, makes a heck of a good boot. You get what you pay for, a quality leather boot will give you good service far longer than the plastic based boots that we're deluged with. Last edited by Hard Scrabble; 12-23-2015 at 04:05 PM.. I don't think the Vibram wears out any faster on the Crestas than any other boot. My point was that the leather uppers are still in usable shape and have outlasted the sole. I had a pair of Raichles re-soled once and they ended up a tad too small. I'm not sure there is any way around this as I think you have to tuck the upper in farther than when they were new and then stitch on the new sole, but I'm not a cobbler. My old pair of Crestas are still usable, I keep them as a back-up pair, but I did go buy new ones for any moderate to difficult hiking.. I was not suggesting heavy duty hiking boots for carries between lakes. Those Vibram soles pick up stones that can damage the bottom of a canoe. In that case, I wore soft bottomed shoes. +1 on the Danner. My insulated hikers are Danners and I love them. I hiked the trail southbound this past September with the very shoes OP mentioned- solomon ultra x, although i had lows rather than mids. The trail was atypically dry and i could not have been happier with these. My pack weight was 25-30 lbs. and i never needed much ankle support so theses were perfect. The gore-tex kept my feet dry without a hitch and were breathable on the hot days. The only dampness i experienced was from rain water wicking down my socks (darn tough socks i also recommend). Again, the trail was very dry and i was able to either walk on top of most mudholes or easily move around them so if you are going out in wetter conditions, mids would be a wise move. I am seriously considering getting a second pair, super comfortable as well! The Goretex membrane breaks down after repeated flexing, allowing water penetration. My 2¢ on this. As background, I thru-hiked the NPT in 2004, but in late August/early September and the trail in some sections were very wet. I have section hiked portions since that time as part of longer backpack trips and now maintain the Moose Pond to Peacock Brook section just south of Placid. Overall the trail has a reputation for being fairly wet in certain sections due to the fact that it follows the low lands, and this will be even in drier weather. I have found that to be true each time I have been on it. 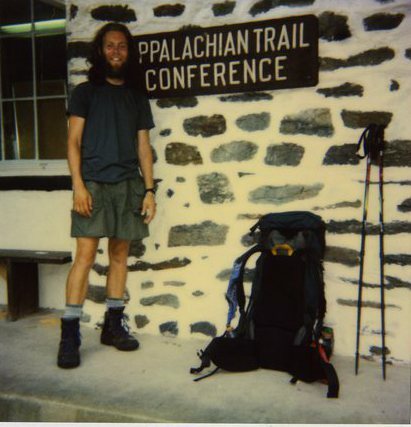 On the 2004 thru-hike, I used a pair of water-proof boots that had a decent amount of miles on them but were not old. They had not leaked at any point up to then. However as I encountered longer sections of mud and water, they eventually soaked through. I don't any think this is unusual as it happen to another pair (different brand) that I used a few years later, but the scenario was the same – they worked fine, were not old but failed when the mud/water were too prevalent. I am not sure what time in May you are thinking of going, but depending on how the snow melts, in early May you could be encountering a trail that just lost the winter snow pack and would be wet without any rain. My choice of footwear if I were to do a thru-hike now (no matter what time of year other than winter) would be something that is not water proof but will actually allow the water in to some extent – hence it will dry faster. I have used all sorts of shoes on my maintenance trips (leather work boots, mid-high hiking boots, trail runners). I have the best luck with mid-high hiking boots that have a good amount of mesh to allow faster drying. As far as a brand, that probably is up to each individual. At any rate it is a nice hike. I'm an all-leather GTX fanatic. I had excellent luck with Danner Explorers until they did something different with the sizing... I don't care how much they insist, these boots do not match Brannock Device sizing. After switching over to TPS 520's I was initially elated until I discovered some issues with them. As with all Asolo boots, they will eventually leak. It doesn't matter if its day-1 or year-5, if you don't Kiwi the hell out of the them they allow a lot of seepage. This type of treatment of course negates their ability to breath properly so really good socks (Darn Taough or Bridgedale, etc) are necessary. They also have an issue with the outter sole separating from the midsole around the heel, and also some sole separation from the toe box. As comfy as they are, I eventually gave up on them after owning three pairs. This past fall I started hiking in the Mammut/Raichle Mt. Trail XT GTX. So far, so good. They're everything there is to love about the TPS 520's with a better sole, better lacing system, and a full rubber rand. Only real problem is that this is Mammut's last year making them. Get 'em while they're hot (er... here). I also always use gators too. Even in dry(ish) conditions they help keep debris out of your boots. I religiously use OR's Rocky Mountain Low gators. They aren't GTX, but they're water resistant enough to do what they need to do and won't break your bank. Get 'em while they're hot (er... here). do they run true to size, or would you order up or down?